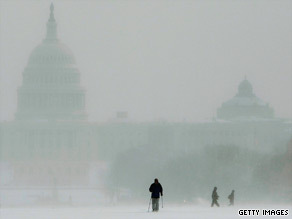 A winter storm is expected to wallop the D.C. area Saturday. Copenhagen (CNN) - In a strange twist, a Washington snowstorm is forcing Speaker Nancy Pelosi, D-California, to make an early departure from a global warming summit here in Denmark. Pelosi told CNN that military officials leading her Congressional delegation have urged the 21 lawmakers to leave Copenhagen several hours earlier than scheduled on Saturday. The Speaker said she has agreed to the new travel plan so that lawmakers can get back to Washington before much of the expected storm wallops the nation's capital. HA HA HA HA HA HA HA. Gotta love the irony. S Callahan God help America! US Taxpayer dollars well spent. hmmm, global warming and snow storm, sounds like an oxymoron, just look who it is, Pelosi and wasted tax dollars.